Integromat is a seamless Teamgate CRM integration which automates and manages repetitive tasks that are killing your precious sales time. To put it simply; Integromat is the simple online hub that gets your apps talking to each other, and performing a multitude of vital tasks every hour of every day – even while you sleep. And, it’s fully customisable to work EXACTLY the way you want. Set the tasks you want Integromat to perform – manage contacts, send automated emails, track projects, manage your lead gathering – while you concentrate on the real important stuff – selling. Triggers, searches, and actions explained. The means by which Integromat connects your CRM apps, and removes those tedious tasks, can be broken down into three main categories. A trigger is an event which occurs in your CRM and causes a response from the Integromat Teamgate integration. This trigger could be as simple as creating a post on Facebook. Once you post to Facebook, Integromat performs the required next step. This next step might be as simple as sending a Slack notification to selected recipients. Other examples of activities which could spark a trigger might be: When a new file is uploaded to your CRM; when a new product is created in the products list; when a new person is created; when a new lead is created; when a new event is created; when a new company is created, or when a new deal is created. In fact, the possibilities for triggers are endless. As part of the CRM automation, an Integromat action does one single job and then passes the result to the next stage of the process. The process of sending the Slack notification about the Facebook post, to a specified recipient is the action carried out. An action could also be any of the following scenarios; deleting a specified person; deleting a deal; deleting a product from the product list; creating a new product; creating a new event, task, call reminder, appointment, or note; creating a new lead, or deleting a lead; delete an event; create a new company or create a new deal; create a new person, or even delete a specified company or file. So, according to the Integromat, CRM task you’ve automated, creating a new post on Facebook was the trigger; sending the Slack notification to a specified recipient was the action; and the act of selecting the person to receive the notification is the search. This recipient could be searched for, and selected using the following criteria; ‘Send notification to all people working in X company’. Just like the ‘working in X company command’ the Teamgate Integromat integration can use a variety of search scenarios, such as; list all teams by given parameters; list all products by given parameters; list all deals by given parameters; list all users…; list all leads…; list all companies…; list all companies…; list all files…; list all people…; etc. How about some Integromat examples? As has been said, with the possibility of thousands of CRM integrations with thousands of independent apps, the bounds of CRM automation are limitless. Let’s try to think of the process in the form of everyday life. It’s morning and you need to go to work, but first you need to search for your car keys. Once you’ve found your car keys you need to take one key from the bundle and give it to a family member to have it copied. You now need to leave the house, enter your car, stop to fill up with gas, and make a phone call while you’re waiting. Once back en-route to work you discover that roadworks have forced you to take a detour, you ask your GPS navigator to work out the best route. Finally you get to work. The whole process doesn’t just involve getting from A to B but involves a sequence of various components – triggers, searches, and actions – to complete the desired process as efficiently, and as quickly as possible. That’s the Integromat Teamgate CRM integration. But, in case that little analogy wasn’t enough, some practical examples for sales professionals might be as follows: E-mail – When you receive new leads and enter them in your Teamgate CRM, Integromat will automatically add these new leads to a selected MailChimp list. Internal – Every time you win a new deal on Teamgate your Integromat CRM integration will send a customised or pre-defined message via Slack to a selected group, or individual. 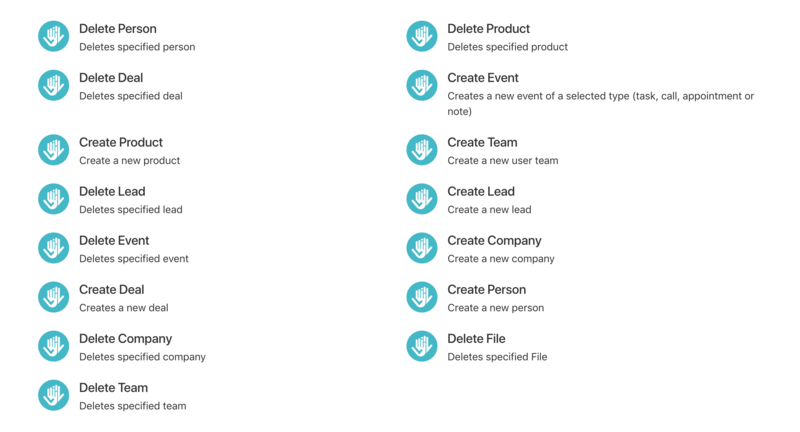 Pipeline management – Create Asana projects automatically from new Teamgate CRM deals. Each time a new deal is created in Teamgate Integromat will create a new specified project in Asana. CRM automation simplified. 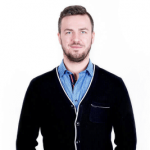 Marketing – Create Teamgate deals for new Intercom users. On every occasion a new user is created for Intercom, Integromat will create a new lead directly within your Teamgate CRM. Why go looking for multiple solutions for existing problems when your Teamgate Integromat integration has the means to resolve all of these problems, from one ‘always on’ resource? Create the integrations you need – by means of Integromat and the applications you use and trust. Simplify countless time-wasting tasks and processes, and get the results you want, in the way you want. 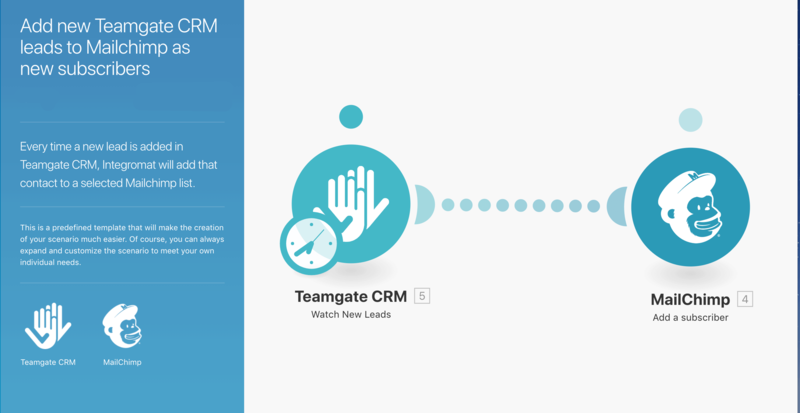 Your Teamgate Integromat CRM integration might just be the best thing that ever happened to your sales process. What can you do more with Integromat? 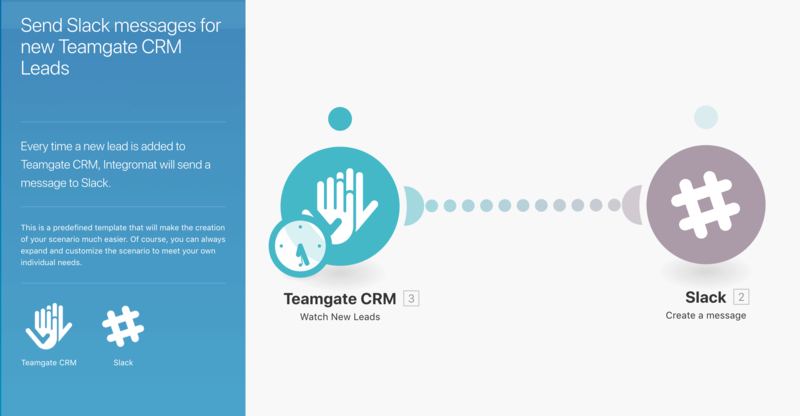 Easily automate repetitive tasks with Teamgate CRM, and enjoy the benefits of a faster, smarter sales workflow process.